Me voici de retour devant mon clavier après un été riche en voyages. Le dernier en date: une semaine de camping le long de la côte Nord Californienne, de Bodega Bay à Crescent City (à la frontière de l’Oregon). Et quelle belle surprise de découvrir que cette région est littéralement couverte de mûriers! Nous nous sommes régalés avec les fruits frais pendant les vacances, et avons fait une grosses cueillette pour en rapporter à la maison. Bilan de l’opération: 8 pots de gelée et une délicieuse tarte aux mûres. Lavez les mûres puis mettez-les dans une bassine à confiture ou autre grande cocotte avec 25 cl d’eau. Amenez à ébullition et faites cuire 10 min. Laissez suffisamment refroidir pour ne pas risquer de vous brûler, puis pressez le contenu de la bassine pour recueillir un maximum de jus et éliminer les pépins (j’utilise pour cela un moulin à coulis). Pesez le jus obtenu. Pour 1 kg de jus, ajoutez 700g de sucre et le jus de citron. Note: N’hésitez pas à ajouter quelques fruits moins mûrs. En effet ils sont plus riches en pectine et permettent à la gelée de prendre naturellement. Here I am, finally back home after a summer rich in travels. The most recent one: a week long camping trip along the North California coast, from Bodega Bay to Crescent City (on the border of Oregon). And what a wonderful surprise to discover that this region is literally covered with blackberry bushes! We feasted with fresh fruit during the trip, and picked a lot of berries to bring back home. 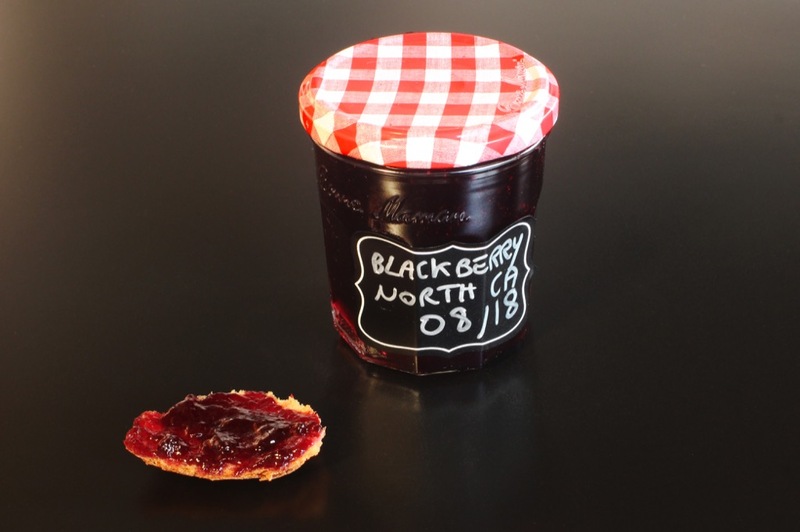 Result of the operation: 8 jars of jelly and a delicious blackberry tart. Here is the recipe which I followed for my jelly, nothing very innovative, but I wrote down quantities and cooking times that resulted in a perfect jelly thickness. Rinse the blackberries, then put them in a preserving pan or large pot with 1 cup water. Bring to a boil and cook for 10 min. Wait until the fruits are not too hot any more and press the fruits to get as much juice as possible (for example using a fine sieve or this tool). Weigh the juice. For 2 lbs of juice, add 1,5 lb of sugar and the juice of 1 lemon. Bring to a boil and cook for 25-30 min, stirring once in a while. Check if the jelly is ready by doing following test: a drop of jelly placed on a plate which was placed in the fridge for 5 min should set immediately; if not keep cooking for a while longer. Ladle the hot jelly into the jars. (If you fill the jars with very hot water, fill them completely while the jelly is still very hot, and turn them immediately upside down, the jelly will keep for months). Enjoy the French way (as a “Tartine” on fresh bread or on a brioche) or on pancakes. Note: Do not hesitate to add some just-underripe berries for making jelly. They are richer in pectin and will help the jelly set. I tried this yesterday with strawberries. Unfortunately my sugars burnt to the bottom a little and I had to change pans. I was letting it boil too strongly I think, better to let it simmer maybe? Anyway, I got 7 jars of good tasting jam, which is a little loose but we like it anyway. I didn’t have time to let it cook longer ? My strawberry jam is a big hit with my family. It set a little more after being in the jars and sealed. I bought blackberries to try now!